Actual, wireless push buttons, not much bigger than the keys on your keyboard, that connects to your Mac through Bluetooth. No dongle required. 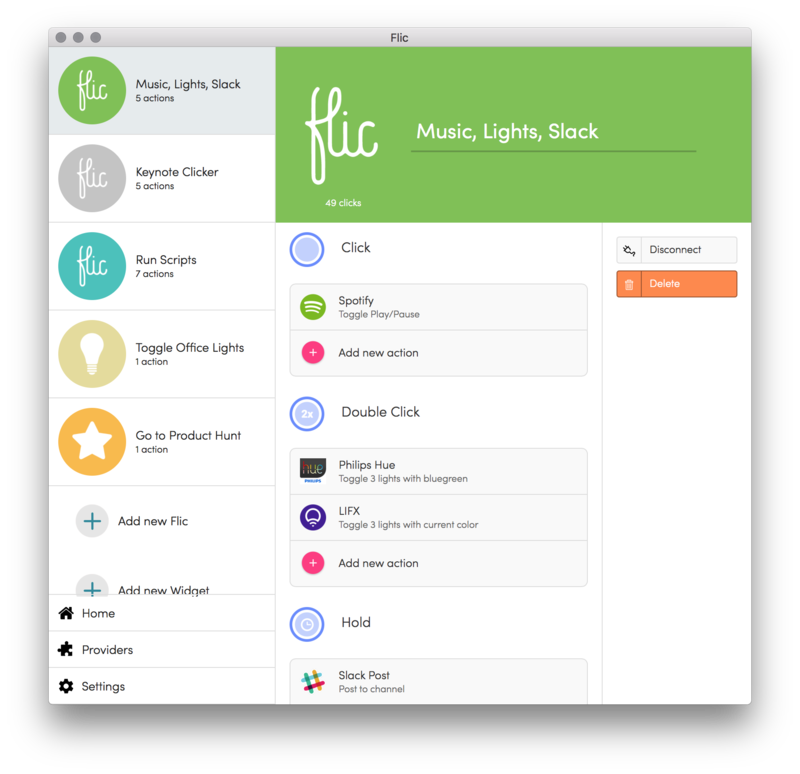 Today we’re proud to release the Flic App for Mac. It’s quite simple: we give you extra buttons for your Mac. Good’ol favorite buttons, but for your desk. Use Widgets to run shortcuts from your notification center without the need of Flic. Slack – to let colleagues know you made a sale or that you’re going for lunch. Internet Request - send a REST command on a click o a button. VLC - Using a Mac as a media center? Flic to control it. ChromeCast - stream pre-defined content with the click of a button. Your kids will love it. XCode - automate your hacking. Web browser - click to open a site. If you miss a functionality, please suggest an idea here. Just like in the Flic apps for iOS and Android, you can have multiple Flic buttons connected to a Mac. Each Flic can be individually configured to do multiple commands on either click, double click and hold. In this setup, I have a green, a white and a turquoise Flic (all mounted on my external screen), a Widget to control the lights in my office and a widget to do this. Access the widget in the Mac notification center. If you already have Flic – good for you! The new Mac app is free to download here. If you don’t have a Flic yet – buy it here or start off by trying widgets in the Mac app without Flic. When we invented the smart button in 2013, we wanted to create a tool to save people’s time and to reduce complexity in technology. We had several use cases in mind. Put Flic in your home to control lights and music. Wear Flic to send distress messages or tell RunKeeper to start tracking your work-out. Give grandma buttons to call you easier. Take smartphone pictures from afar. We came up with hundreds of applications and things to control with the button and built one of the most extensive apps we have ever seen, natively on both iOS and Android, implementing almost everything our customers wanted a button for. Now we bring all that to Mac, along with the FlicLib - probably the best Bluetooth Low Energy library out there. Expect lots of new functionality to be added soon, and don’t hesitate to contact us if you have any questions. @Joacim how about a simple "one click means spacebar" (or any key) function? would be great for play and pause for example on netflix. Oh yeah, great idea !! @samsonxander You write your scripts as you were doing under Hax but turn them into plugins. That's what I've done to create a flic that controls which internet radio station my mac plays. Hope that helps. I'm missing the Telldus service in the mac app, any information on when it will be availible? Great news guys, well done. Tried it all works well. Only drawback for me is that there's no script running feature that was present in Hax. Yes I could sort of do it via Xcode, but it relies on a single desired script being tee'd up in the whole time, and doesn't allow specific scripts for certain button presses (unless I've misread the situation). I get that Hax was just meant to be a bridge for more advanced users to get going with Mac scripting, but I think there are quite a few users who liked Hax and were just waiting for use with multiple buttons. I'm one of them. Please can the next release bring back the script launching facility, just as it was in Hax, except maybe prettied up to match the standard Flic UI.